The value vs control or DLMA Matrix is a tool for analyzing the balance of skills and behaviours between the executive and the board. DLMA analysis is a technique developed to evaluate how well corporations perform when it comes to the balance of skills and behaviours between the executive and the board. DLMA is an acronym for directorship, leadership, management, and assurance (also known as governance*). It's pronounced "dilemma". Whilst the last three management disciplines are familiar, directorship in a new term created because there is no term in the language of corporate governance to recognition and describe the board's vital role in value creation. I propose that a corporation's long term performance and ability to sustainably create value is based on the correct balance of all four disciplines. While at the same time recognizing three inherent tensions. The tension between the Board and Executives. The tension between value creation and value protection. The tension between all four forces of control - directorship, leadership, management and assurance. to ensure that more value is created than expended in its production (value protection). I propose that corporate longevity and resilience is a result of both functions. The greater the surplus value measured in all its forms the more resilient the corporation. The key to the matrix is to understand that, from a corporation’s perspective, value is neither price nor profit. Rather, value represents the energetic potential of all forms of capital to do the work of change. In simple terms, the more value available to the corporation the more likely it is to not only survive, but grow. This is nature’s iron clad law of long termism. Short termism is generally not a product of greed or an absence of ethics, it stems from a fundamental misunderstanding that value is not a synonym for money. short termism means more money but less value. And less value means a company is closer to death than life. Feel free to add your own definition of value and the matrix is still useful. But I think the transformative power of the framework is released when used in conjunction with the idea that value is a form of social energy that is stored in various types of capital. 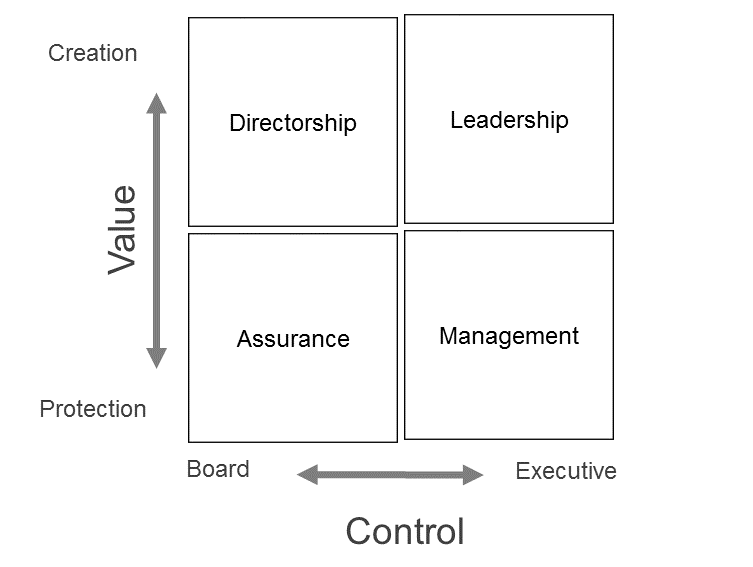 The value vs control matrix is intended to identify strengths and weakness across value creation and protection. Horizontal. The quadrants above the line are focused on value creation: risk taking, people-centric, about innovation and commercialization. Below the line represents the quadrants that focus on value protection: risk oversight, process-centric, about control and financialization. Vertical. The left side of the matrix represents the board perspective, whilst the right side provides the executive role. Diagonal. Assurance and leadership represents perspectives that can be practiced throughout the organisation without formal authority; whilst directorship and management require specific delegated authority. Only managers manage and directors direct. DLMA Analysis is principally a brainstorming tool. it provides a simple, structured and effective way to provoke a new way of thinking and shared insights. 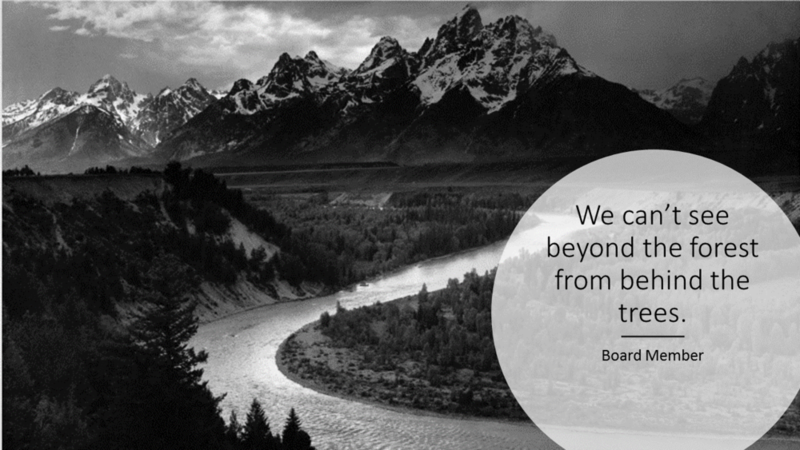 What value means to both the board and the executive. Where an organization is focused? What percentage of time, energy and thinking is devoted to each quadrant. How is control divided between the board and management. Is the balance of control and value right for the organisation. Grant Thornton’s report ‘The Board: creating and protecting value’ used DLMA Anaylsis to undertake a cross- sector review executives and non-executives from a range of organisations including charities, housing associations, universities, local government, private companies and publically listed companies. This report uses the DLMA analysis which categorises skills into four areas: Directorship, Leadership, Management and Assurance. This powerful tool provides a framework (see graph 1) with which to evaluate how well an organisation is performing in balance of skills and understanding of roles; and responsibilities between the executive and Board. It helps align risk (value protection) and opportunity (value creation) with overarching strategy and purpose. The idea is that by looking at these four quadrants, the board can ensure that they have a balance of the abilities needed to tackle their wide-ranging responsibilities. It can also help to identify whether members are currently using its time and energy in the right places. The report says that – for a board to be effective – both executive and non-executive directors need to create value (seize opportunities) and protect value (manage risk). I don’t mind if you use it. But just ask that you acknowledge the work that’s gone into it and tell me if you think more work is needed. * As a matter of practice, corporate governance has come to be used in all kinds of ways I find unhelpful. For example it has been used as both a singular noun to describe the (a) the process of value protection in dozens of different ways (b) investment strategy by other means and (c) a collective noun inclusive of value creation and value protection processes. But to be honest with myself, the real reason I avoid corporate governance is because it’s not much of an acronym. Nov 5 What is Directorship ? Aug 18 What do turtles and shareholders have in common?